Swimming Goggles RX - Buy online! Only € 49! - Weblens - Your Contactlenses Online ! Do you need swimming goggles? 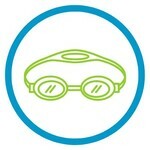 Our swimming goggles of the brand View are suitable for persons from 6 years. They come with 3 sizes of nosepieces so you can widen or narrow the swimming goggles. This can be adjusted at any time thanks to the super simple click system. Order your swimming goggles online at Weblens at the best price!